A progress report of my attempt to be more focussed. Knit on the swirl. I’ve realised this makes good tv knitting, so I’ve been knitting this instead of the socks. I’m on welt 5 of 64. 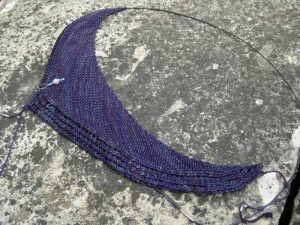 Mid-September (maybe) start the Catkin KAL. Probably later than mid-September, since neither Beth nor I have the yarn yet. 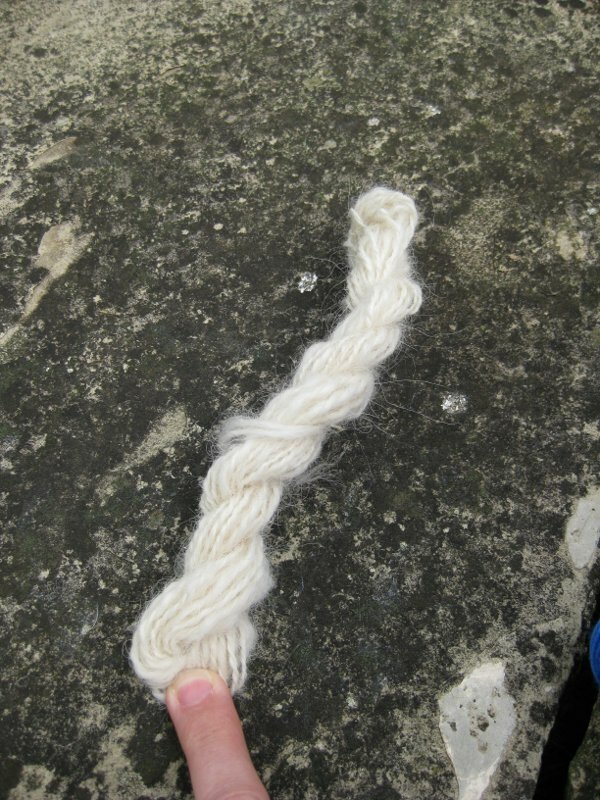 I had a go at plying some of my spindle-spun handspun the other day. It looks like real yarn (and I even added it to my ravelry stash). Let’s be honest, this is heirloom yarn and will never be knitted. I’ve been watching my spinning dvd, which has lots of good tricks about plying well and managing a wheel, but doesn’t start early enough in the process for me to feel much more confident about using the wheel. Still, I’m learning more. Here’s my current travelling project. Just enough pattern to keep me interested, but simple enough to memorise the pattern. I rather like the york stone paving slabs in the garden as background to knitting photos. What do you think? It makes a great backdrop!